Our most prestigious apartment (100 m²), renovated in 2008, is located on the second and last floor of the building and enjoys a magnificent view of the sea. Ideal for four persons but equipped to host up to six. There are two bedrooms, one double and the other with two single beds, and a lounge with satellite TV and a double sofa bed. The large kitchen has a relaxed view of the sea and overlooking a spacious terrace furnished with table, chairs and large sliding curtain. The completely new bathroom is equipped with shower and washing machine. 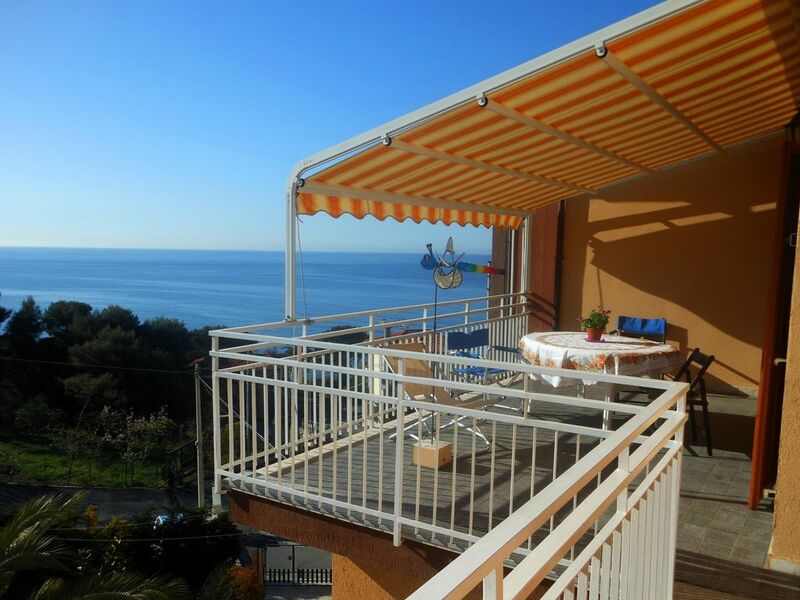 The house, located 200 meters from the sea, is set in a quiet, rural area, away from the busy city, but not far from all services: 2 Km, San Lorenzo al Mare, beaches, shops and restaurants; 6 Km, Imperia, provincial capital; 14 Km, Sanremo, the famous tourist city. Convenient parking in our yard and large common garden with two barbecues, tables and chairs. In the three-storey building there are some apartments occupied by stable families and other given to rent for short periods. Francesco and Marina are waiting for you, with the little Sara (2005) and Andro (2007). We live in this beautiful region of Liguria, among the olive trees clinging to the steep cultivated terraces and the wonderful sea of ​​the Riviera dei Fiori. We moved to this bucolic setting, leaving the hectic city life. Year after year we have arranged different accommodation. Some to rent permanently and others to offer the possibility of a peaceful and economical holiday, both in summer and winter. Wide parking in our yard. The room are clean and well maintained, the landlords are really attentive. We enjoyed indeed to live 8 days in Francesco's apartment house. Peaceful and beautiful environment, nice weather, nicely renovated, cozy apartment, good parking area. Francesco was very kind and helpful in responding to all our requirements. Traffic on Via Aurelia is quite busy and so access to pedestrian street is some challenging. As said earlier, we were happy indeed for this week and would be pleased to recommend the apartment to coming visitors. First I have to say that Francesco is the worst photograph ever. The appartment is better than what the pictures show. Nicer and larger rooms. Very clean . Beautiful view. Nice surprise. The owner is friendly and available. Would go back again. Our family is coming to Ai Ciapin for more than 5 years in a row, sometimes more than once a year. We were watching all these years how Francesco and Marina are working hard to make their property ideal place to spend vacation in this most beautiful part of Liguria. This is their full-time job and they are taking it seriolusly making constant improvement a principle! We just don't look for another place when we are thinking about spending time at the sea - no matter whether it's summer or winter. The quality of the accomodation fits rather to german standards than italian, so the quality-price ratio is exceptional and unusual for Italy. For sure if you make your choice you will never regret it! Just make sure you are booking it half a year before the date! How to answer... we are proud to have such a friendly guest that appreciates all our efforts! "The apartment is really clean, quiet, comfortable and beautifull view of the sea. The owner is very friendly and merry. Place is situated enought far from sandy beaches and shops, but if you have the car, you will not problem." This appartment is very clean and really good invested. We traveled with our dughter (20 months) and were happy to have a washing machine in the bath room. Also in the kitchen we nearly did not miss anything (maybe except of a simple coffee/tea machine :-) ). You have a gas stove, a big refridgerator, a separete freezer (outside of the refridgerator) a microvawe and many other usefull tools. We loved the very big balcony with the beatifull see view where we took breakfast and also could relax during our daughter was sleeping in the afternoon. On the back of the house you can find a play field with toys for children. Our daughter very enjoyed to play there. Thanks again Francesco and Marina. Thank you very much for this great appreciation! A quiet rural area between Imperia and Sanremo overlooking the wonderful sea of ​​'Riviera dei Fiori'. The sea ... is there at your doorstep. From the apartment you can walk to a small rocky beach, perfect for the adventurous; those looking for rather more comfortable seats, can find sandy beaches with facilities in virtually every country along the coast (nearest within 2 km). In recent years borned a great bike path overlooking the sea. The 24 km flat course connect San Lorenzo al Mare to Ospedaletti without ever leaving the coast. In Arma di Taggia there is also a variation of about 3 km away that allows you to enter the Valle Argentina coming in the old town of Taggia. They are then countless itineraries suited to fans of hiking, mountain biking or climbing. - Consumo elettricità, acqua, gas cucina e riscaldamento centralizzato: inclusi nel prezzo (per periodi inferiori alle tre settimane) - ANIMALI domestici: SOLO in seguito a dettagliato accordo - biancheria non inclusa, solo su richiesta (dobbiamo saperlo qualche giorno prima): . lenzuola: 5 €/persona, . asciugamani: 3 €/persona (kit telo bagno, asciugamano, bidet).